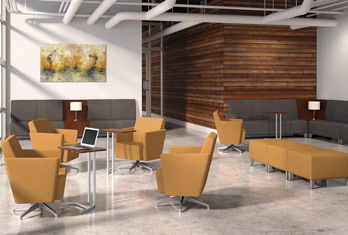 At Workspace Solutions, we do more than sell office furniture, we create spaces. Whether you are redesigning your entire campus or just a few rooms, our office planners and designers can help you get the most out of all of your spaces. We'll help you make a great first impression on new and existing customers, encourage collaboration between your employees, and create functional places to conduct meetings and training sessions. Whether you have a large or small budget, we have the office furniture and design experience to create the right solution for your space. Facilitating collaboration in your workspace allows your employees to exchange ideas and move projects along faster with better results. Collaborative spaces have also been shown to build trust and improve employee relationships. We have the perfect collaboration furniture for every environment. Make a great first impression on your clients with a well planned waiting room. Sleek and modern or comfortable and cozy, our planners can help you find the tables, chairs and accessories to create the perfect space for your customers while they wait. Spaces that inspire and encourage learning are important in many offices. Our planners can help you design the perfect place to conduct orientations, training sessions, and any other teaching that's important to your business. 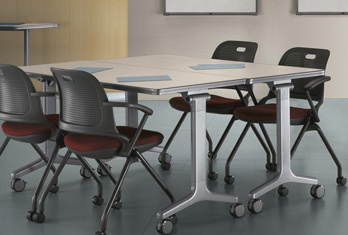 Elegant board rooms, functional meeting spaces, and more. With a wide variety of new and used furniture in lots of materials and fabrics, our planners can work to transform a room of any size into the perfect meeting room. Often, your employees are doing very different tasks while working together towards a common goal. Because of that, some spaces have to serve multiple functions. Our designers can help you plan a workspace that meets all of the demands of your business. Open office environments encourage collaboration and promote trust, but sometimes your team needs a private space to work. Our office planners will help you integrate the two in a workspace that works for everyone.